This volume represents 27 peer-reviewed papers presented at the ICOP 2013 symposium which will help conservators and curators recognise problems and interpret visual changes on paintings, which in turn give a more solid basis for decisions on the treatment of these paintings. The subject matter ranges from developments of paint technology, working methods of individual artists, through characterisation of paints and paint surfaces, paint degradation vs. long time stability, to observations of issues in collections, cleaning and other treatment issues as well as new conservation approaches. Illustrations note 102 Illustrations, color; 30 Illustrations, black and white; XV, 430 p. 132 illus., 102 illus. in color. 1. 20th Century Oil Paint. The interface between science and conservation and the challenges for modern oil paint research .- 2. Do we see what we know or do we know what we see? Conservation of oil paintings in the Stedelijk Museum Amsterdam.- 3. Towards interpretation of making, meaning, and change in British 20th century oil paintings: the relevance of an artist's paint archive.- 4. The delight of modern organic pigment creations.- 5. Modern Oil Paints - Formulations, organic additives, and degradation: some case studies.- 6. Distinction by micro-Raman spectroscopy and chemometrical analysis of copper phthalocyanine blue polymorphs in oil-based and acrylic paint samples.- 7. 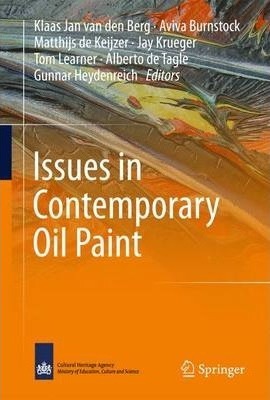 Charting the development of oil-based enamel paints through the correlation of historical paint technology manuals with scientific analysis.- 8. Hans Hofmann's last lesson: a study of the artist's materials in the last decade of his career. 9. Theoreme de Goedel by Georges Mathieu, 1957. Study and restoration: consolidation through cohesive regeneration using a solvent.- 10. Non-traditionally painted oil painting: how to treat it properly? Josip Vanista's Cakes (1955).- 11. Conservation Issues in Several 20th-Century Canadian Oil Paintings: The Role of Zinc Carboxylate Reaction Product.- 12. Zwei Junglinge und Zwei Madchen, a tempera painting by Otto Mueller, circa 1917. Paint analysis and reconstruction.- 13. Metal soaps and visual changes in a painting by Rene Magritte -The Menaced Assassin, 1927.- 14. Fleurs Grises - A delicate surface. Difficult to clean - Essential to protect.- 15. Derivatisation technique for infrared spectroscopy - Characterisation of oxidative ageing products in modern oil paint. 16. Investigating fluidizing dripping pink commercial paint on Van Hemert's Seven-series works from 1990-1995.- 17. Hard dry paint, softening tacky paint, and exuding drips on Composition (1952) by Jean-Paul Riopelle.- 18. Zinc white and the influence of paint composition for stability in oil based media.- 19. It's surreal: zinc-oxide degradation and misperceptions in Salvador Dali's Couple with Clouds in their Heads, 1936.- 20. Water Sensitive Oil Paints in the 20th Century: A study of the distribution of water-soluble degradation products in modern oil paint films.- 21. An investigation into the viability of removal of lead soap efflorescence from contemporary oil paintings.- 22. Set back the race: Treatment strategies for running oil paint.- 23. Sensitivity of modern oil paints to solvents. Effects on synthetic organic pigments.- 24. Dry Cleaning: research and practice.- 25. New Approaches to Surface Cleaning of Unvarnished Contemporary Oil Paintings - Moist Sponges and Cloths.- 26. Agar - a new tool for the surface cleaning of water sensitive oil paint?.- 27. Investigation into the surface conductivity of water-sensitive modern oil paints. Klaas Jan van den Berg Institute for Cultural Heritage, Netherlands (and Institute of the Dutch Ministry of Education, Culture and Science).